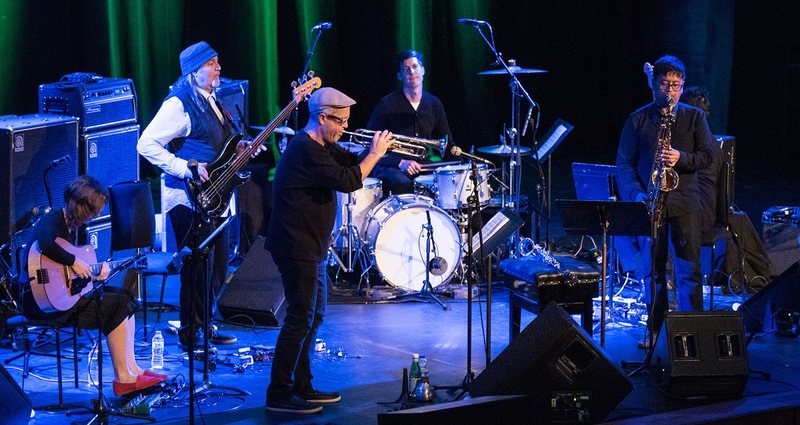 Man-of-many-projects Dave Douglas’s latest band is an edgy electro-acoustic ensemble. Two amplified guitars, Rafiq Bhatia dealing in a range of effects and Mary Halvorson with a slightly sharper, cleaner tone and Bill Laswell’s effortless depth on electric bass, as much felt as heard, thicken the sound. Ches Smith adds to it, with drums miked to deliver a cavernous echo and sharp cymbal work. Douglas on trumpet and Jon Irabagon on reeds throw unprocessed sounds over the top. The pieces they play are from Douglas’s UPLIFT series, conceived as a response to dire political events worldwide. 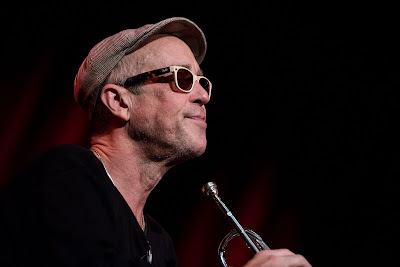 The opener has a fittingly uneasy turbulence, guitars furnishing organ sounds, the bass grumbling and growling, thrashing drums, and some Milesian trumpet peals over the top before a screaming tenor sax solo and then interweaving guitars, Halvorson raising the temperature with some bottleneck exclamations. There were calmer interludes later: sombre muted trumpet, softly suspended at times, beautiful alto clarinet from Irabagon, and occasional nods to more conventional jazz styles. But the dominant sound blend was the more minatory mix they began with - with an underlying current of unease the more positive declamations from the front line almost, but not quite dispelled. This is wordless artistry, and there was little spoken exhortation, after one impassioned reminder from Douglas that “we’re at a difficult moment for our species”. So how does the musical statement relate to the worldly matters that the players want to highlight? This wasn’t exactly good time music (which is a fine thing but you don’t want it all the time). Nor did it amount to a call for action (ditto). I guess the political charge lies in pointing to such issues, then using each of them as a jumping off point for a piece that does leave you feeling good - among other things. Antidotes to despondency, created afresh, are always worthwhile. Political engagement? You tell me. Musical brilliance? Sure. Uplift? Yes, I think so.